The Chief Conquerist of the Dobraxu Expansion Army, the diminutive alien Marjantar may not seem like much of a threat, but inside the high-tech Exomek vehicle, Marjantar becomes a near-unstoppable threat on whatever world they may be trying to conquer. But near-unstoppable is not unstoppable, as Marjantar has learned time and again in their efforts to conquer Zunoltia, where the Astro-Hero is ever there to defend against such threats. With the loyalty of dozens of fellow Dobraxu soldiers, also using vehicles similar to the Exomek, Marjantar repeatedly attepts to make moves against Zunoltia. A failure of this magnitude could hurt Manjantar’s standing in the army, so they must try again and again, each time with more desperation. I don’t think I have much to comment on for this one. 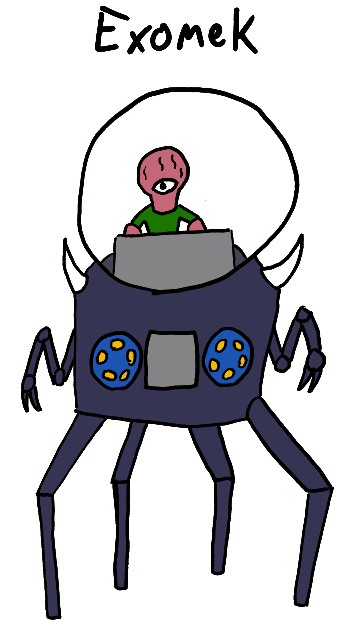 I knew I wanted to give a villain to the Astro-Hero, so when I drew an alien invader, it seemed like a good fit. And, just to be complete, let us say that inside that vehicle there, behind the controls, Marjantar has a snake-like lower body, coiled around some more controls. There is a group called the Weird Assassins. If you’ve got a problem with someone who isn’t just a normal joe, you need an assassin who isn’t a normal assassin. That’s where the Weird Assassins come in. For a price these strange individuals will help you bring down anyone, no matter what. 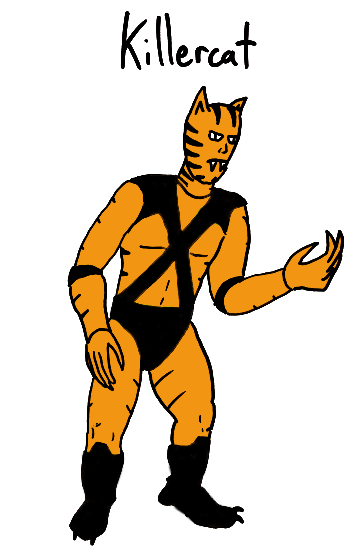 Killercat is one of the Weird Assassins. 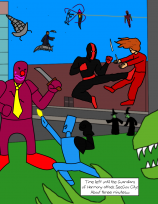 Lewis Ridder has enhanced agility and reflexes as a result of cosmic energy released by a superhero fight in the middle of a city when he was young. He resents superhumans for what they did, though he has managed to find a way to make it pay off for him. Offering his services as a Weird Assassin helps Lewis put his children through school, keep food on the table, and he gets to end the occasional superhuman in the process. This is another character who existed as a sketch in my files, nameless and storyless, so I decided to make up some stuff. The phrase “Weird Assassins” came to me and I figured I should work with that. After all, as normal as a guy in a cat suit being hired to kill people would be in the context of superhero comics, that’s some weird stuff man. Anyway, all too often a superhuman assassin in comics would be a killing-obsessed angry person with no life, so I though I’d do something otherwise here. I can expect I’ll probably end up doing more Weird Assassins over the course of the year.